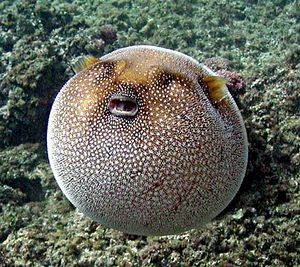 Please copy and paste ' [[Category:Puffer Fish (Saltwater)]] ' into the end of your article to include it in this category. These saltwater pufferfish belong to the family Tetraodontidae, and the spiny pufferfish belong to the family Diodontidae. Tetraodontidae, or Pufferfish, are the second most poisonous vertebrate in the world. The family contains at least 121 species of puffers in 19 genera. They are most diverse in the tropics and relatively uncommon in the temperate zone and completely absent from cold waters. They are typically small to medium in size, although a few species can reach lengths of 99.1cm (39"). Diodontidae, or Porcupinefish, are closely related to Pufferfish but Porcupinefish have heavier spines (hence the name porcupine) on their body. Also unlike the Pufferfish, they have only a single plate of fused teeth in each of the upper and lower jaws. Porcupinefish are medium to large sized fish, and are found in shallow temperate and tropical seas worldwide. A few species are found much further out from shore, wherein large shoals of thousands of individuals can occur. They will learn to recognise their owner, and will start begging from them. Pages in category "Puffer Fish (Saltwater)"
This page was last edited on 4 September 2015, at 11:36.